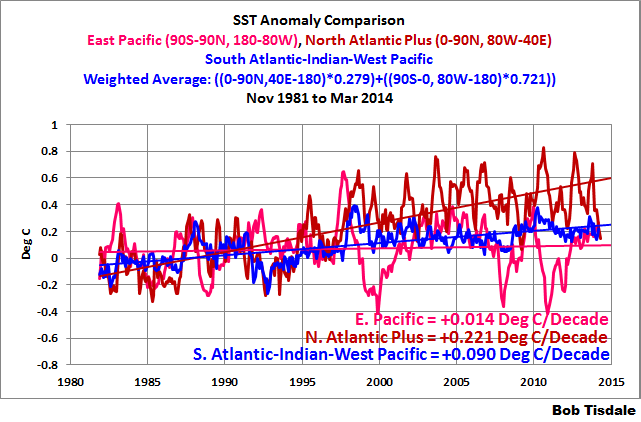 The 2014/15 El Niño – Part 6 – What’s All The Hubbub About?… | Watts Up With That? Since the first of the year, there have been hundreds, possibly thousands, of news stories about the growing possibility of a strong El Niño evolving this year. Your local weather forecaster has probably mentioned it a couple of times over the past few months. Joe Bastardi of WeatherBELL Analytics has made regular visits to the cross posts of this series at WattsUpWithThat. Also in that time, the blogosphere has been alight about the possible El Niño…with many of the posts by climate alarmists providing more misinformation than facts. 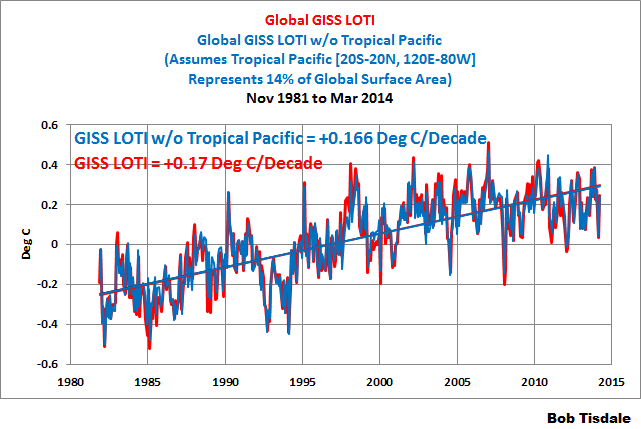 We discussed one of those alarmist posts in The 2014/15 El Niño – Part 2 – The Alarmist Misinformation (BS) Begins. Because El Niño events are typically tied to the seasonal cycle, this El Niño, if it continues to develop and it likely will, would peak in November 2014 to January 2015. So you may be wondering why there’s all the interest in some slow-developing weather event that may happen to grow throughout the rest of the year. El Niño events are by far the largest of any weather-related phenomenon taking place on the planet, and they impact weather around the globe. If you think tropical cyclones (hurricanes) are big, sometimes it takes two cyclones straddling the equator in the western Pacific just to kick start the initial processes that might cause an El Niño to form. Only catastrophic explosive volcanic eruptions like El Chichon in 1982 and Mount Pinatubo in 1991 can counteract the global effects of an El Niño. We’ve all seen animations of hurricanes forming over the eastern tropical North Atlantic, just west of Africa, and we’ve watched the satellite images of those hurricanes spiraling as they march their way westward toward the Americas. (Those of us living along the Atlantic or Gulf coasts watch a little more closely.) As an El Niño develops thousands of miles west in the tropical Pacific, that developing El Niño suppresses the formation of hurricanes by chopping off their tops…through a phenomenon called wind shear. That’s why forecasters reduce the number of possible hurricanes during an El Niño-development year. The impact of El Niños on hurricanes was first reported by longtime hurricane forecaster Dr. William Gray, Professor of Atmospheric Science at Colorado State University. See Gray (1984) Atlantic Seasonal Hurricane Frequency. Part I: El Niño and 30 mb Quasi-Biennial Oscillation Influencesand Atlantic Seasonal Hurricane Frequency. Part II: Forecasting its Variability. Parts of the U.S., Australia and other regions around the globe have been plagued recently by drought. The persons living through them understand that the lack of precipitation has been influenced, to some extent, by the recent dominance of La Niña events (or the non-Niño 2013/14 season). La Niña events, though the processes behind them are not the opposite of El Niño events, can have effects on regional weather that tend to be the opposite of El Niños—with tend being the operative word in that sentence. So droughts might be lessened in some parts of the globe if an El Niño forms this year. 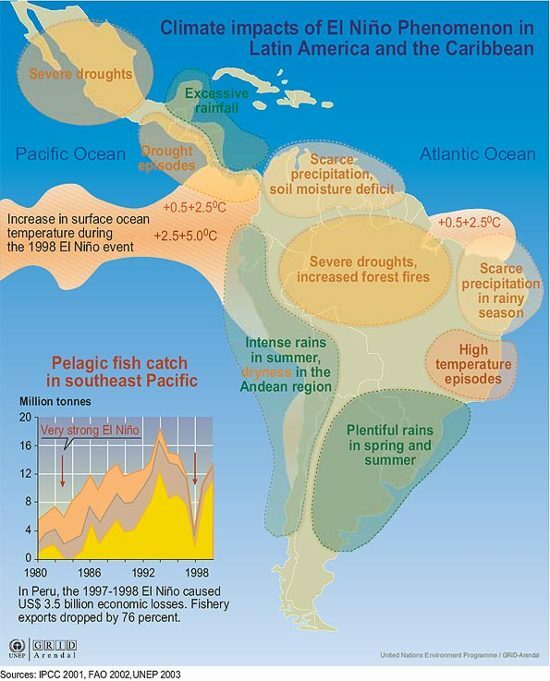 On the GRID-Arendal webpage Climate impacts of El Niño Phenomenon in Latin America and the Caribbean, they provide a map (Figure 1) which shows the impacts of the 1997/98 El Niño on those regions. Note the graph that presents the impact of that El Niño on the fishing industry. Fisherman there would not be looking forward to a strong El Niño. The Royal Netherlands Meteorological Institute (KNMI) webpage Effects of El Niño on world weather illustrates the typical impacts of El Niño events on precipitation, temperature and tropical cyclones around the globe, on seasonal (quarterly) bases. Lots of detail. The UK Met Office (UKMO) has a similar webpage titled ENSO Impacts, where ENSO stands for El Niño-Southern Oscillation. El Niño in that commonly used term represents the ocean component and the Southern Oscillation represents the atmospheric side. Figure 2 shows the maps prepared by the UKMO for El Niños, with precipitation on the left and temperature on the right. Each ENSO event is different, and occurs in conjunction with other climatic events. Not all impacts occur in all events, and impacts may not be confined to the regions indicated. Thus these maps should not be regarded as forecasts for a current event, but rather as an indication of areas where impacts are likely, based on historical evidence. Japan Meteorological Agency (JMA) also has El Niño Monitoring and Outlook discussions. Researchers at the Japan Agency for Marine-Earth Science and Technology (JAMSTEC) have been studying the differences in the impacts on weather of Central Pacific El Niño events (El Niño Modoki) and East Pacific El Niño events. Yes, El Niños come in different flavors depending on which part of the equatorial Pacific they directly influence. As their names imply, some El Niños are focused more toward the central part of the equatorial Pacific, while others, the stronger ones, also extend into the eastern portion. See Ashok et al. (2007) El Niño Modoki and Its Possible Teleconnection. Now you may be wondering how a weather-related event in the central and eastern equatorial Pacific causes all of those changes in weather patterns around the globe. I’m going to borrow parts of a couple of illustrations from my book Who Turned on the Heat? for this portion of the discussion. But first, I want to try to impress on you the size of the tropical Pacific. There are lots of stats about the monstrous scale of the Pacific. The Pacific Ocean covers about 33% of the surface of the globe, more than the continental land masses combined. El Niño events take place along the equator in the Pacific, and the equatorial Pacific stretches almost halfway around the globe as shown in Figure 3. 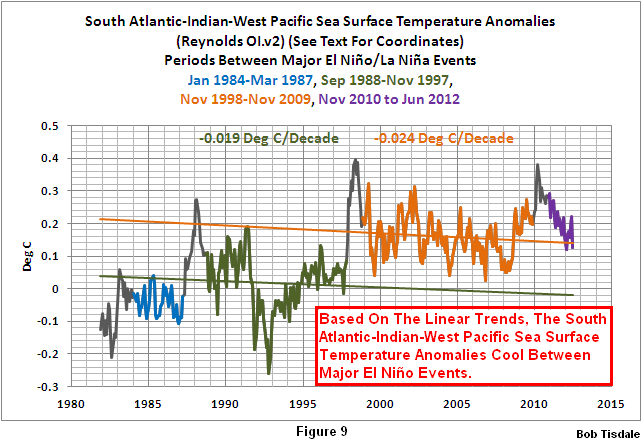 Figure 5 is a cartoon-like image of the Pacific Ocean during “normal” conditions (aka ENSO-neutral conditions). The trade winds blow across the surface of the tropical Pacific and the sunlight-warmed water accumulates in an area of the western tropical Pacific known as the West Pacific Warm Pool. In effect, it’s “stacking up” against the land masses there. As a result of that trade-wind-blown process, the West Pacific Warm Pool contains some of the warmest ocean water on the planet. With the warm water comes lots of evaporation. As the warm moist air rises, it cools and condenses, forming clouds and eventually falling as rain. Rainfall in that part of the world is also extremely high. Back to scale and the enormity of the Pacific: the West Pacific Warm Pool can grow to be the size of Russia or about twice the size of the United States, and that pool of warm water can be 300 meters deep in places. Because West Pacific Warm Pool is so large, and because the water is naturally so warm, it is one of the primary sources of moisture for the atmosphere globally, and because of its enormity and warmth and because of its impact on atmospheric circulation, the West Pacific Warm Pool helps to direct the locations of the jet streams in both hemispheres. So “normal” weather on the planet is, in effect, partly governed by the location of all of that warm water in the western tropical Pacific. During an El Niño, that warm water floods eastward. See Figure 6. Back in the late 1990s, in response to the very strong 1997/98 El Niño, almost every weather event on the planet was blamed on El Niño. Cartoons about El Niño effects became commonplace. There used to be a collection of them at the Florida State University (FSU) Center for Ocean-Atmospheric Prediction Studies (COAPS) website. Sadly, it appears FSU has removed them. Some were quite funny. Of course, there’s still a portion of the Saturday Night Live El Niño skit with Chris Farley on YouTube. To sum up this section, El Niño events can cause drastic changes in “normal” weather patterns. Some of the changes may be good for some parts of the globe, and in others, the changes caused by a strong El Niño may be catastrophic. One thing for sure: there will be people blaming any weather catastrophe on hypothetical human-induced global warming. It has been well known for decades that global surface temperatures warm in response to El Niño events and cool in response to La Niñas. (But they don’t cool proportionally during La Niñas, and we’ll expand on this later in this section.) Figure 9 presents the global surface temperature anomalies based on the average of the three suppliers: GISS, NCDC and UKMO. Also shown are the average of the global lower troposphere temperature anomalies based on the RSS and UAH datasets. Both averages have been smoothed with 12-month filters to reduce the seasonal components and weather noise. I’ve highlighted the spikey responses of global surface temperatures to the stronger El Niño events. La Niña events are responsible for most of the dips. The exception to that is the large dip caused by the eruption of Mount Pinatubo in 1991. It should be obvious from Figure 9 why global warming alarmists are looking forward to a strong El Niño for the 2014/15 ENSO season. It’s possible 2014 would be the warmest on record. But because the global effects of an El Niño peak a few months after the event tops out in the tropical Pacific around December, it’s likely that 2015 would be the warmest on record if there was a strong El Niño in 2014/15, bringing a quick end to the hiatus in global warming. Well, that’s what they’re hoping for. 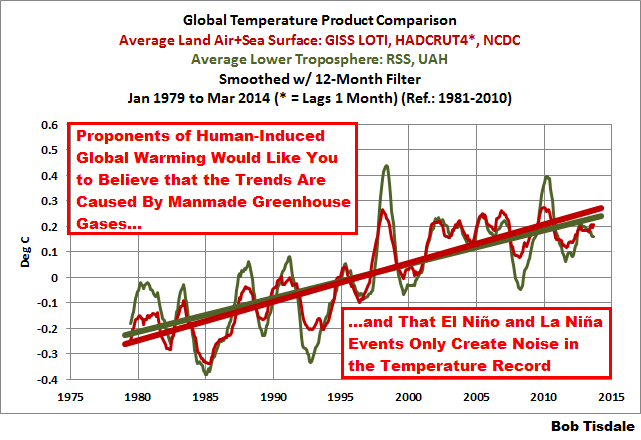 As I noted on Figure 10, proponents of human-induced global warming believe, and would like you to believe, that the manmade greenhouse gases are responsible for the warming over that time period, while El Niño and La Niña events only create noise in the temperature record. Their hypothesis of human-induced global warming depends on that relationship. First Frame: The Cowtan & Way (2013) global surface temperature data show a clear increasing trend, but it is “noisy” because multiple influences are present in the data (AGW, ENSO, volcanoes, solar cycle). Of course, any portrayal of El Niño and La Niña events as noise is intended to mislead or misdirect. It’s nothing more than nonsense based on their misunderstandings or misrepresentations of El Niño and La Niña processes. There are a number of other examples being used by the global warming enthusiasts. Dr. Trenberth failed to discuss the causes of the “big jumps” in his RMS article. 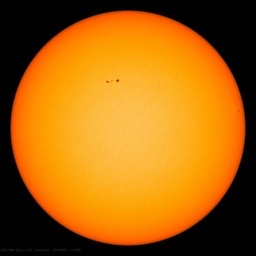 In the blog post Open Letter to the Royal Meteorological Society Regarding Dr. Trenberth’s Article “Has Global Warming Stalled?” (WattsUpWithThat cross post is here. ), however, I illustrated and discussed the reasons for them. They were the Pacific Climate Shift of 1976, the 1986/87/88 El Niño and the 1997/98 El Niño. See Figure 12. In that blog post, I provided a short introduction to the processes through which those two strong El Niño events caused upward shifts in the sea surface temperatures of the global oceans. I also provided a link to my well-illustrated essay “The Manmade Global Warming Challenge” (42MB), which is a more detailed introductory discussion of the processes through which strong El Niño events cause the upward shifts in sea surface temperatures, and in turn global surface temperatures. We have been illustrating and discussing the long-term effects of El Niño and La Niña events for more than 5-years. My first presentations of those effects were in the two-part January 2009 blog series “Can El Niño Events Explain All of the Global Warming since 1976?” Part 1 is here and Part 2 is here, with the cross posts at WattsUpWithThat hereand here. Since that time, we have confirmed in numerous blog posts and in numerous ways that an El Niño is the discharge phase of a recharge-discharge-redistribute process that is chaotic, naturally occurring and sunlight fueled. (Thanks to all of you, here at ClimateObservations and at WattsUpWithThat, who contributed to our understanding of ENSO.) The instrument temperature records (NODC ocean heat content data and Reynolds OI.v2 satellite-enhanced sea surface temperature data) indicate the oceans warmed as a result of naturally occurring processes, not in response to manmade greenhouse gases. Again, if this topic is new to you, please refer to the essay “The Manmade Global Warming Challenge” (42MB). In summary of this section: At the beginning of it, I noted it has been well known for decades that global surface temperatures warm in response to El Niño events and cool in response to La Niñas. But only a few portions of the surface of the global oceans respond, warming and cooling, proportionally to El Niño and La Niña events. And that’s important. The eastern Pacific Ocean from pole to pole and from the dateline to Panama is one of them. The East Pacific (90S-90N, 180-80W) covers about 33% of the surface of the global oceans (about 24% of the surface of the globe), so it’s not a small area. While it responds proportionally to El Niño and La Niña events, the surface of the East Pacific shows little to no warming over the past 32+ years, which is the satellite era of sea surface temperature data. 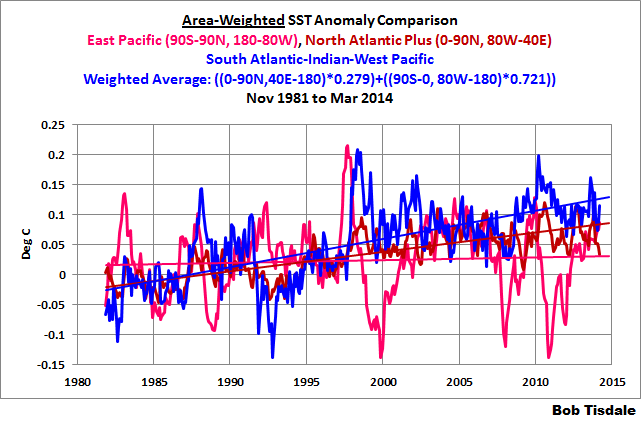 Refer to the graph here from the March 2014 Sea Surface Temperature (SST) Update. And the sea surface temperature anomalies of the East Pacific serve as a reasonable indicator of the timing, magnitude and duration of El Niño and La Niña events. So I’ve compared the sea surface temperature anomalies of the East Pacific to those of the rest of the world (Atlantic-Indian-West Pacific, also from pole to pole) in Figure 13. Note the step-like response of the sea surface temperatures of the Atlantic, Indian and West Pacific Oceans in response to the 1986/87/88 and 1997/98 El Niño events. 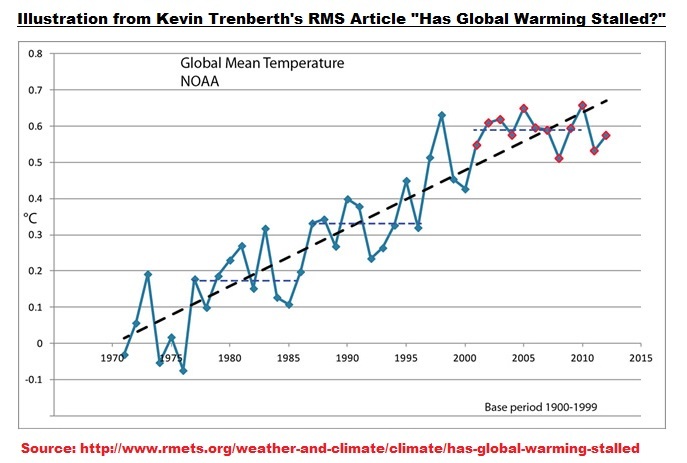 Those are what cause Trenberth’s “big jumps” in global surface temperatures. It’s blatantly obvious that the sea surface temperatures of the Atlantic, Indian and West Pacific Oceans are not cooling proportionally to the La Niña events that follow the 1986/87/88 and 1997/98 El Niños. 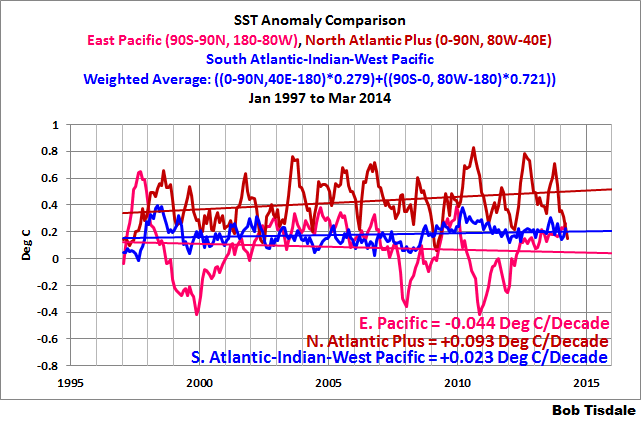 Refer also to the color-coded graph of the sea surface temperature anomalies of the Atlantic, Indian and West Pacific Oceans here from the March 2014 Sea Surface Temperature (SST) Update. And if you haven’t yet read the post and essay linked earlier in this section, here’s a relatively brief explanation of what causes those step-like shifts in the sea surface temperatures of the Atlantic, Indian and West Pacific Oceans. 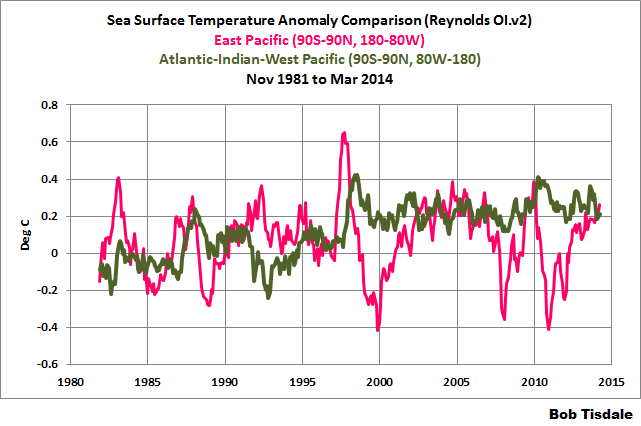 An El Niño releases a vast amount of warm water from below the surface of the West Pacific Warm Pool. (Important thing to consider: When the warm water was below the surface of the west Pacific Warm Pool it was not included in the surface temperature record. During and after the El Niño, the warm water is included. The result: A quick, naturally caused rise in global surface temperatures.) That warm water floods into the East Pacific, where it temporarily raises the sea surface temperatures. 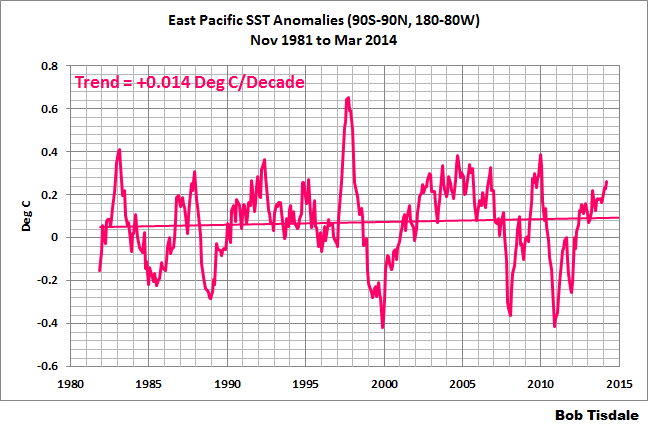 See the spike in 1997/98 in Figure 13 in response to the 1997/98 El Nino. After the El Niño, the trade winds push all of the left over warm surface water back to the western tropical Pacific, where it is distributed poleward and into the eastern Indian Ocean. There is also a phenomenon called a slow-moving Rossby wave that returns warm subsurface water (left over from the El Niño) back to the western extratropical Pacific. (The slow-moving Rossby wave is visible in the animation here, at about 10N in the tropical Pacific, after the 1997/98 El Niño.) That subsurface warm water left over from the El Niño is redistributed around the globe, where it eventually rises to the surface, and it is also fed back to the equatorial Pacific to serve as fuel for secondary weaker central Pacific El Niños, like those that occurred in 2002/03, 2004/05, and possibly 2006/07. The leftover warm water accumulates in regions of the western extratropical Pacific, areas known as the Kuroshio-Oyashio Extension (KOE) and the South Pacific Convergence Zone (SPCZ), where sea surface temperatures rise drastically during the La Niñas that trail the strong El Niños. Those leftover warm waters counteract the La Niña taking place in the tropical Pacific and prevent surface temperatures around the globe from responding fully to the La Niña. There is much more to El Niño event than a simple warming of the eastern tropical Pacific. They have strong impacts on weather around the globe. A strong El Niño event can also cause an upward shift in the temperatures of two-thirds of the surface of the global oceans, while having no apparent long-term effect on the other one-third. Those upward shifts in surface temperatures give the appearance of a relatively steady rise in global surface temperatures when the data are looked at globally. As a result, the rise in global surface temperatures have been incorrectly attributed to human-induced global warming. That means the climate science community is no closer to finding evidence of the human fingerprint in global warming than they were in the early 1990s, the early years of the IPCC. The IPCC has no one to blame for that than themselves, with their focus on carbon dioxide. My ebook Who Turned on the Heat?goes into a tremendous amount of detail to explain El Niño and La Niña processes and the long-term aftereffects of strong El Niño events. Who Turned on the Heat? weighs in at a whopping 550+ pages, about 110,000+ words. It contains somewhere in the neighborhood of 380 color illustrations. In pdf form, it’s about 23MB. It includes links to more than a dozen animations, which allow the reader to view ENSO processes and the interactions between variables. I’ve lowered the price of Who Turned on the Heat? from U.S.$8.00 to U.S.$5.00. A free preview in pdf format is here. The preview includes the Table of Contents, the Introduction, the first half of section 1 (which was provided complete in the post here), a discussion of the cover, and the Closing. Take a run through the Table of Contents. It is a very-detailed and well-illustrated book—using data from the real world, not models of a virtual world. Who Turned on the Heat? is only available in pdf format…and will only be available in that format. Click here to purchase a copy. Thanks. April 30, 2014 in El Nino Basics. Nobody has ever shown any skill at forecasting ENSO 6 months out. FergalR, there’s a chunk (<—technical term) of warmer-than-normal water below the surface of the eastern equatorial Pacific. The sea surface temperature anomalies for most of the tropical Pacific are at or near the +0.5 deg C threshold of an El Nino. The only holdout had been the far eastern equatorial Pacific, but it's anomalies are now positive. It is possible, but unlikely, that an El Nino may fail to develop. Bob, I believe that’s true for parts of US. But here in Australia, La Nina means rain, El Nino drought (and heat). You can see this in your third BoM cite. Fig 1 shows the winter/spring El Nino pattern – dry. And in most of the S and SW, that’s important rain time. It’s true the current drought is worst in Qld, which has more summer/autumn rain. But Fig 2 shows the pattern there, and while the El Nino difference is less, it’s still on the dry side. 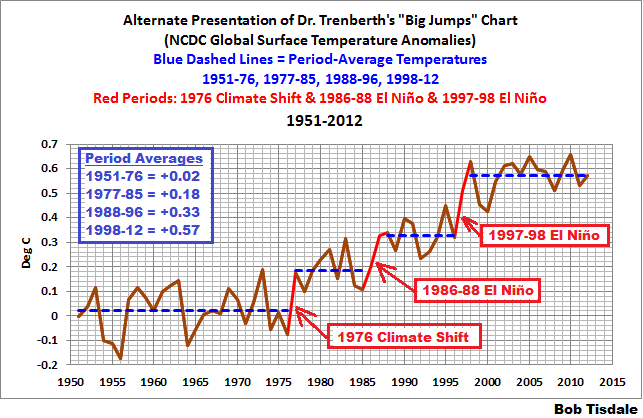 Bob, a casual review of the “steps” leaves an impression as expressed by Trenberth that the climate shifts up with an El Nino but it doesn’t shift back down. Looking at your fig. 15, one could imagine the steps going up forever. Isn’t there more to say about this process? I’m confused about the PDO… Long term forecasters like Joe D’Aleo are saying the PDO is in cold phase/ Given that, he’s confident this will not be a strong el nino. Judith Curry is also calling this a cold PDO. She too is skeptical this el nino will come to much. Bob, I believe you’re telling us the PDO is actually positive. Yet I get the sense you don’t think this El Nino’s going go be a pause buster either. Harvard says its the sun wot done it. Want to know how I know this el nino will be weak? The SOI number (best el nino indicator) had a positive (+) 6.4 reading for month of April. That doesn’t happen with the strong ones. It doesn’t just peak and collapse. I think there is enough heat in the ocean to cause an el nino, but it’s not looking strong at all so far. It looks like April will miss official el nino status and May will barely squeek by (maybe). This looks like a June-July-August el nino which are usually fairly moderate. I also predict it won’t last anywhere near as long as the 1997-98 el nino. This one will be a complete spent force by next March. Bob, the step-increases in temperatures shown in your diagrams and charts make sense. Although I know you are not in the prediction business, I am curious whether you think a period of step-decreases can occur and if so, what the mechanism would be. Thanks. What were the results of El-Nino’s prior to 1950? (Ref. your “Figure 12”). Do El-Nino’s disappear when temperatures are dropping? Nick Stokes spot on re Australia. La Niña goes with rain. Bob I know it is difficult to avoid saying El Niño causes this,that and the other but in reality it is just a description of a developing pattern. The pattern does not cause anything, it is just associated with events. The cause is the heat from the sun, the tides, currents and Coriolis forces and the interaction of the sea with the land masses. 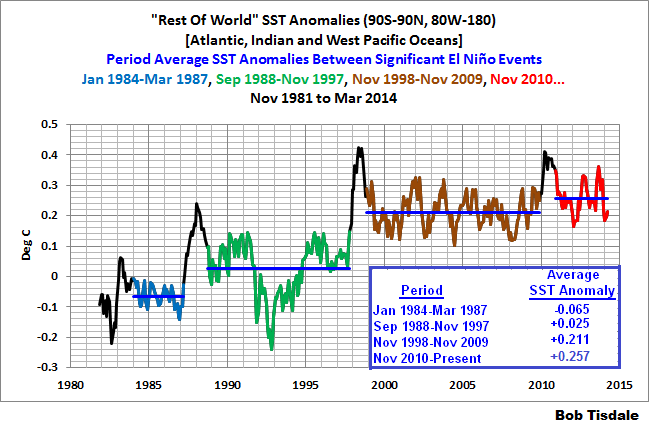 Yes the SST may go up but not because of El Niño, it is El Niño because the SST goes up with the sea temps. An ElNino event is vaguely more likely than La Niña as we take a random walk and currently it is on the positive side so closer to an El Niño. Does anyone remember the last El Niño prediction? It was only 9 months ago, strongly pushed and went away unfulfilled. I’m doubtful that this El Nino will have much of an effect in North America other than a minor redistribution of seasonal snowfall, rainfall and temperature patterns, given all of the other factors at work. Perhaps the desert southwest will get a little more rain and snow, and the great lakes region will get a little less. Perhaps Manitoba and Winnipeg won’t be quite so cold, and the cold won’t hang on so long. Those would be good things. I imagine there will be little for the alarmists to crow about. Cold and snow records next winter will continue to be established, just in different places. I was busy in the bamboo grove during spring, El Nino 2009. The most notable thing was the continued prevalence of oceanic winds during the “event”, in spite of the much publicised Big Dust. (The outback silt sometimes takes wing on the westerlies and heads to the ocean, where it dumps far more iron than any fleet of ships could do). This was very different to the El Ninos of the 1990s, giving us more a European than an East Australian spring – a season in which you expect inland winds to dominate till October, at least, even without El Nino. 2009 was an El Nino, with fewer storms into the new year, though it was not the parching, windy affair it was supposed to be. This is because ENSO is not a mechanism, just a rough observations set. As Nick and angech point out, El Nino is supposed to spell heat and drought for Eastern Oz, La Nina is supposed to give us a good drenching. Yet one of our worst years for heat and fire was the 1938-9 La Nina, and the 1997-8 Super El Nino was relatively benign compared to the “weak” events of 2002-3 and 1902-3. The BoM presently does not even define any year between 1926 and 1940 as El Nino, but the 1930s were Australia’s driest-known decade. Drought in Oz never reads the ENSO instruction book. We were a drier continent for a half century before the big wets of the 1950s and I often wonder how the alarmists who won’t even recognise such a significant fact can be so well informed about decades of weather which haven’t even happened yet. Do plankton (etc) act like clouds in the ocean, keeping the sun’s energy near the surface where it is easily re-radiated to space ? 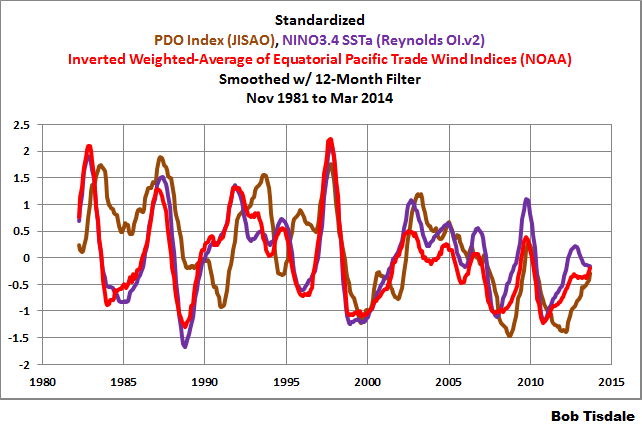 During PDO cold or Nina phase only 25% of years are ENSO Nino positive. During these years ocean temperature, evaporation, and rainfall shift from the subtropical Americas to subtropical Australia and China. The salient question is why the eastern Pacific American phase seems to have so much more power regarding atmospheric temperature. Some horse riders will always get on or off on the left side of a horse, and tell you that’s the way it should always be. That’s not wise advice. Several posters here and some not here always refer to the PDO as cold or warm. And that is not wise. It perpetuates the notion that the index is a reference to temperature. All should use the terms “negative” and “positive” with an understanding of the mathematical derivation and meaning of the index. Whatever they say will happen likely won’t. Don’t think anybody predicted the pause. Either way, hoping for rain for California. I may have missed this, and apologise if I have, but what causes the warm water to flow east? Is it simply a “toppling effect” where the trade winds can no longer support the build up, or do the trade winds reduce ? Part of the upward steps result from the additional warming of the North Atlantic associated with the Atlantic Multidecadal Oscillation (AMO). If we remove the North Atlantic from the Atlantic-Indian-West Pacific data shown in Figure 13, then the South Atlantic-Indian-West Pacific data show a somewhat saw-tooth-like pattern; that is, they rise during a strong El Niño, don’t cool proportionally during the trailing La Niña, but do show a slow long-term cooling before the next strong El Niño causes them to rise again. We’ll have to see how the North Atlantic responds to the El Niño, assuming there is an El Niño of consequence, and what influence it may have had on the other ocean basins. I haven’t come to a conclusion about how strong the El Nino might be. Also, as noted in detail in the previous post in this series, the PDO is an aftereffect of ENSO, so it doesn’t dictate the strength of El Nino events. El Ninos vary in strength on decadal and multidecadal bases, and combined with the effects of the sea level pressure of the North Pacific, they cause the spatial pattern of the sea surface temperatures of the North Pacific known as the PDO. Given you’ve had to cut down on blogging I’m impressed! Since so much of the climate debate centers on explainging the past or forecasting the distant furture it’s fun to look into the coming year for a change. As I red the article I expected you to relate the excess heat in the eastern pacific to the heat capacity of the atmosphere but that is perhaps more relevant to Trenberths reasoning of the oscillating Nino/Nina imposed on a rising AGW trend? Thanks for explaining the (maybe) upcoming phenomenon, there will be a lot of attention and spin about it depending on how it plays out and it is good to be prepared. Considering the processes of ENSO, with El Ninos as the discharge phase and La Ninas as the recharge, I can’t think of any mechanism that would cause step decreases. Well, DAMN. nicky stokes FINALLY said something of use to….. anyone! You’re on the right track. That was discussed in the first of the series. A temporary reversal of the trade winds, known as a westerly wind burst, initiates the Kelvin wave. Now, as more and more warm water rises to the surface in the central and eastern equatorial Pacific, this causes additional weakening of the trade winds. And that positive feedback reinforces the formation of the El Nino. Does this question relate to the difference between east Pacific and central Pacific El Nino events? If so, with an East Pacific El Nino, the warm water from the Pacific Warm Pool has spread farther east and covers a greater surface area of the tropical Pacific. The atmosphere is responding to the greater evaporation taking place because of the additional warm surface water. There were studies about something along those lines about 5 to 10 years ago. But I don’t recall the outcome or where I saw the discussions. Sorry. Question: Is there any definitive paleorecord of El Ninos and La Ninas? You have noted that La Ninas, in some (most?) cases, do not quite cancel out the warming from El Ninos. It occurred to me that it would be interesting to see how / if the cycles corresponded and changed, with the LIA. Since the first of the year, there have been hundreds, possibly thousands, of news stories about the growing possibility of a strong El Niño evolving this year. Indeed, and here is a bit of climate perspective. We present a 47-year-long record of sea surface temperature (SST) derived from Sr/Ca and U/Ca analysis of a massive Porites coral which grew at ~ 4150 calendar years before present (B.P.) in Vanuatu (southwest tropical Pacific Ocean). Mean SST is similar in both the modern instrumental record and paleorecord, and both exhibit El Niño-Southern Oscillation (ENSO) frequency SST oscillations. However, several strong decadal-frequency cooling events and a marked modulation of the seasonal SST cycle, with power at both ENSO and decadal frequencies, are observed in the paleorecord, which are unprecedented in the modern record. …..The most intense ENSO activity within the reconstruction occurred during the mid-seventeenth century. Taken together, the coral data imply that the majority of ENSO variability over the last millennium may have arisen from dynamics internal to the ENSO system itself. Here, we present a high resolution marine El Niño flood record from Peru. A period of extreme drought without strong flooding occurred from A.D. 800–1250. Anomalous precipitation patterns characterized the entire Indo-Pacific ENSO domain, with dry events in the northern Arabian Sea and the mid-latitudes of both Americas, coinciding with wet periods in the Atlantic Cariaco Basin….. The variability of El Niño/Southern Oscillation (ENSO) during the Holocene epoch, in particular on millennial timescales, is poorly understood. Palaeoclimate studies have documented ENSO variability for selected intervals in the Holocene, but most records are either too short or insufficiently resolved to investigate variability on millennial scales1, 2, 3. Here we present a record of sedimentation in Laguna Pallcacocha, southern Ecuador, which is strongly influenced by ENSO variability, and covers the past 12,000 years continuously. We find that changes on a timescale of 2–8 years, which we attribute to warm ENSO events, become more frequent over the Holocene until about 1,200 years ago, and then decline towards the present. Periods of relatively high and low ENSO activity, alternating at a timescale of about 2,000 years, are superimposed on this long-term trend. We attribute the long-term trend to orbitally induced changes in insolation, and suggest internal ENSO dynamics as a possible cause of the millennial variability. 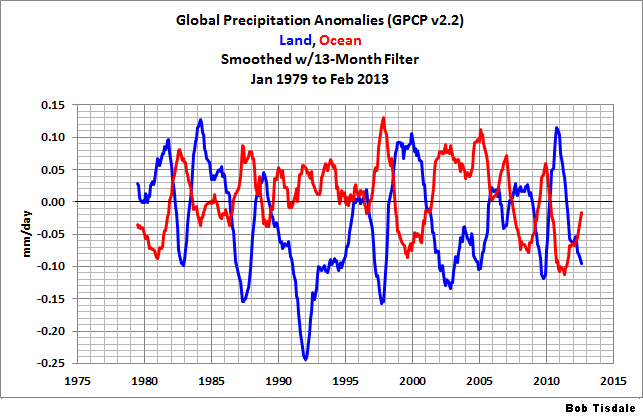 However, the millennial oscillation will need to be confirmed in other ENSO proxy records. Jimbo, thanks for the links to the papers. They’ll come in vary handy during the next few months to rebut some of the nonsense we’re bound to see. Thanks again. That website was so much easier to navigate when all of the studies were listed on one page by category. I haven’t presented a theory. I’ve presented data. My presentation covers the past 32+ years. 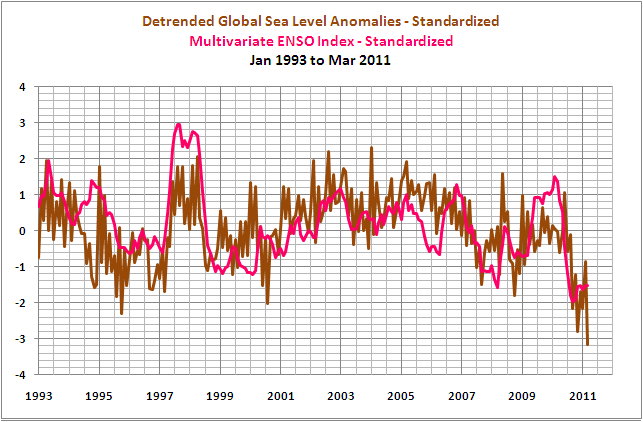 Right now, some of the future response to ENSO depends on what the North Atlantic is doing; that is, has the AMO peaked? If so, how would a downturn in the AMO suppress those upward shifts? Bob thanks for your articles. When I plot a time series of NINO3-4 anomaly against the (appropriately scaled) seasonally averaged time derivative of the Cape Grim (Tasmania) CO2, I see a very similar curve with the CO2 derivative delayed by 12 months. This is not what one would expect to see if the anthropogenic input was in any way significant – or am I missing something? What is most likely cause for El Niño to predominate over La Niña, and vice versa? Is it random or due to clouds or some other influence? Nick caught a mistake in my last post, too. In both instances, they were last-minute additions while I proofread. So I wrote myself a post-it note that reads “No more last-minute adds”. There are lots of cyclist theories, but I haven’t found any that sound realistic. I suspect you’ll see some of them later on this thread in response to your questions. If the pattern is always an increase, then shouldn’t the oceans eventually boil over or the increases stop at a certain temperature? Jimbo linked to studies showing El Niños happening over a millennial time scale. So if the pattern’s always an increase, ocean temperatures should keep increasing ad infinitum, right? Somehow, that doesn’t pass the sniff test. I qualified my answer, Katherine, with “Considering the processes of ENSO, with El Ninos as the discharge phase and La Ninas as the recharge, I can’t think of any mechanism that would cause step decreases.” Over the past 32+ years, ENSO has been acting as a recharge-discharge oscillator. Did it act differently millennia ago? Dunno. I’ve heard of paleo studies that say ENSO has in the past gotten stuck in one mode for decade-long periods. That’s possible with Bjerknes feedback. Why doesn’t it happen now? What would be the ramifications? And how would global temperatures respond? The warmer water in the undercurrent is now surfacing. Some +2.0C and+2.5C upwells are showing up now. 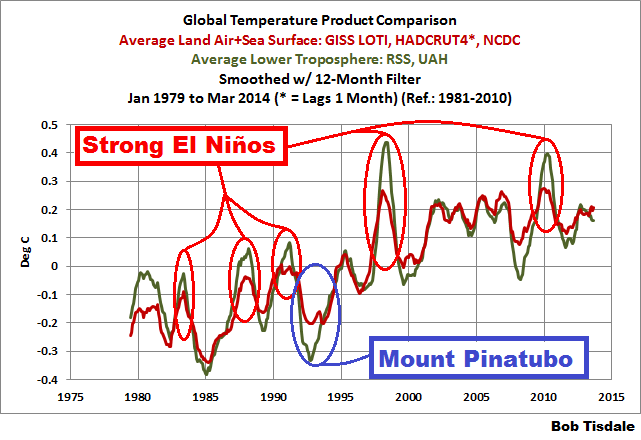 The step changes of El Ninos should be considered in the context of the 60 year cycle in temperatures. Did the 1957, 1965 and the 1972 El Ninos cause a step change. 1888? 1911? Thanks, Bob. This is a very good article, with more to learn from ENSO. “The IPCC has no one to blame for that than themselves, with their focus on carbon dioxide.” and we have wasted inordinate amounts of money. This elso will provide the moisture for biblical snow storms this coming winter the kind that buried mammoths. This is all interesting stuff , Bob, however your orthodox exlplanation of El Nino does not seem to match the observations. The warmer water, if anything is crossing at about 150-200m depth , not on the surface as your diagram shows and according to classic “sloshing back” theory. The anim. shows the bulk of warm water welling up from below to the S.Am coast. It is also building in volume and intensity as it goes. On the face of it, that seems odd without the water above also warming. The only thing I can think of is that since this is a 0 north section that warm water must be moving into the 0. N line from further north or south. I’m again reminded of the NOAA animation of the wave movement of the thermocline. measurements in the equatorial Pacific from 1992-1996, indicate that during the strong El Niño events, the release rate of CO2 from the ocean to the atmosphere was reduced to 30-80% of that of normal non-El Niño periods. This decline in carbon dioxide release from the sea to the air is large enough to be seen as a CO2 anomaly in the atmosphere. Warm water holds less CO2 already, if it further cools at the surface it will start to take up CO2. I generally agree with Bob about the mechanism but I think that it’s related to magnitude of Nino/Nina activity. The process is a throughput of solar energy being captured (or not) and transferred to the atmosphere. Larger swings , more throughput , more warming. Subdued activity: less capture and throughput , allows other processes like radiative losses to space to let the surface cool. I wonder what beats the thermocline into waves, Greg. Figure 9. We should be careful about spurious attribution to Mt Pinatubo. The downward trend started in 1989 , well before the eruption and that pre-existing variability probably accounts for about half the drop. This spurious correlation is one of the main reasons for over-estimating the sensitivity of climate to volcanic radiation changes…. and hence CO2 radiative effects. Compare to El Chichon in 1981 which was almost a big in terms of optical density. The temp drop is nothing like Mt. P. This demands more attention to detail to avoid spurious correlation and false conclusions. Willis argues that tropics are largely self correcting and that is generally true. (though not quite that black and white). Good question. My hypothesis is that it is the same thing that creates surface tides. Lunar and solar tidal forces. There is a density difference at the thermocline ( temperature and salinity). It is small, about 1/1000 of the difference of air/water at the surface. That means the frequencies that will prevail , or resonate, will be 1000 times slower. 12h * 1000 = 1.4 years. That is the kind of timescale ENSO variations operate on. I’m curious. What do global average surface temps look like with the ENSO region masked? Almost identical, Nino34 is a very small area. Bob the SOI is rising rapidly and currently is currently at +7.3 approaching the La Nina value of +8. Doesn’t this cast doubt on the suggested El Nino development later in the year. It seems like Bob is reporting that (over the past 32 years or so) there has been a steady net increase in the total heat content of the air/ocean combination. And further, that much of this heat is being stored in the Western Pacific where it is periodically released by El Nino events into the atmosphere, creating the steps in his charts. Is this exactly what some of the warmist crowd is saying as well? That the excess heat is in the oceans? And then they add that the REASON the total system heat content is rising is man-made CO2? This shows in Table1 that ocean warming reported as heat flux applied to Earth’s entire surface area (in W m-2) corresponding to trends in annual REP OHCA dropped 90% when 1983- 2011 is compared with 2004 – 2011 for the 0-100 meter depth with lesser though still large decreases when calculated from 0-300 and 0-700 m levels. In short the oceans are cooling from the top down as might be expected on a cooling planet. Bob the SOI is rising rapidly and currently is currently at +7.3 approaching the La Nina value of +8. Tahiti pressure steady, Darwin rising. Warmer waters around Tahiti to lead to lower pressures and reduce SOI ? There was a really good 3D animation of the thermocline depth (from TAO array from memory) but I can’t find it in my bookmarks , nor directly. It was some fancy 3D computer graphics generated movie. If anyone has a clue about that, pls post. Bob, you mentioned el Nino affecting the jetstream. What about vice versa? What if the circum-polar vortex is weak again and we get a wavy jetstream? My cross section Figure 6 is not anomalies. 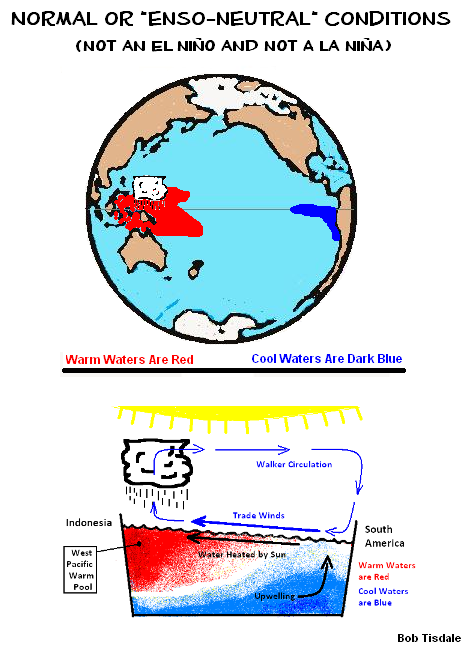 It is presented as “warm waters in red” and “cool waters in blue”. Your cross section animation is presented as anomalies. Are we looking at the same graph, Greg? GISS Aerosol Optical Depth data disagrees with you. 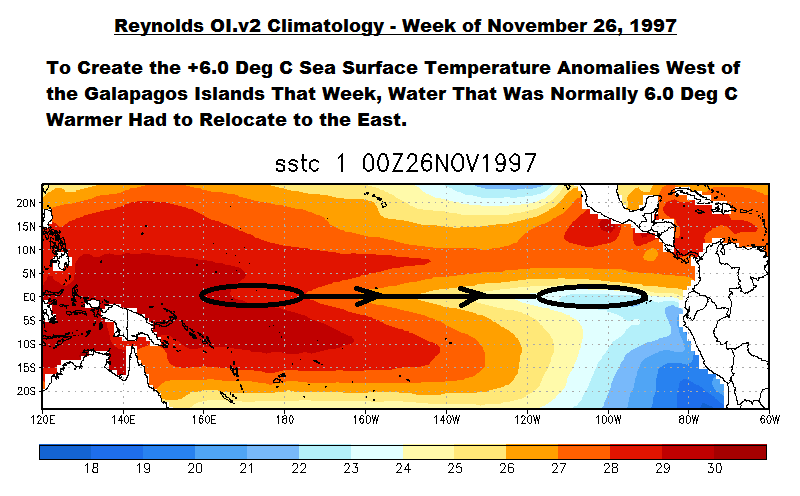 El Chichon was in 1982 and it was also up against a stronger El Nino. We’d be hard pressed to tell the difference if they were side-by-side instead of overlapped. You are correct, it was not as strong globally , El Chichon AOD peaked at about 13 compared to 21 of Mt.P. but comparable. Well that’s the whole point, you can’t make excuses for El Chi , then not account for background variability during Mt P. The later was ‘helped’. You see in graph the “strong El Nino” was at an end before the eruption, so much of the drop could be expected to have a happened any way. You did not subtract on you graph but just ringing “Mt Pinatubo” invites the assumption (which is generally what is done in climatology) that Mt P was directly correlated to and responsible for that dip. It wasn’t. Only partly. Here you can see that TOA radiation budget had a well established downward slope long before Mt P. went off. If this sort of thing is ignored the volcanic effect looks strong than it really is. So yes, El Chichon should be stronger and Mt P should be weaker than they appear at first glance. Sorry. I haven’t seen any studies of it. OK. So if these “warmer waters” are spreading from the normally warmer WP warm pool at the surface, why do they not show up as positive anomalies on the normally not so warm regions? Why does the data show this packet of warm water moving at depths of between 150 and 200m when the orthodox account has surface waters flowing back? This one, at about 1:50? The SOI is impacted by off-equatorial weather, which is why researchers in the 1990s looked for a sea surface temperature based index from the equatorial Pacific. Thanks Bob. I don’t think that is the one I recalled since it is surface height not thermocline depth. TC is just shown in equatorial section, not 3D. I’d also seen that one but in much higher quality. However, this is interesting for your comparisons to 1997/8. You can see that did seem to be all the way to surface contrary to what we are currently seeing. Helped? Mount Pinatubo erupted in June 1991, just as the 1991/92 El Nino was starting to develop, so you’re not seeing much, if any, of the effects of the 1991/92 El Nino in the global temperature record. Mount Pinatubo was obviously strong enough to overcome the effects of the lesser 1991/92 El Nino, while the lesser El Chichon only counteracted the effects of the much stronger 1982/83 El Nino. Are we discussing what has happened in the tropical Pacific up to this point, this year? That is, are we talking about this animation? The Kelvin wave has only shifted and pushed down on the subsurface waters up to this point; thus the reason it’s called a downwelling Kelvin wave. It pushes down on the thermocline. (There’s a NOAA webpage that, when discussing a Kelvin wave, asks you to imagine floating in the ocean. Each wave only shifts you a few feet.) Much of the warming we’re seeing at the surface of the central and eastern equatorial Pacific is due to upwelling of the warmer water that’s shifted east. Keep in mind, the El Niño hasn’t developed yet. The El Niño starts to get cooking with positive feedback after the trade winds slow in the western tropical Pacific and then reverse, in response to the initial warming in the east caused by the Kelvin wave. With the reversal of the trade winds, then a lot of warm water starts to flow from west to east. Give it time. Gotta go. Be back this evening. I think Bob presents data only from the current warm period. I don’t believe that these “steps” are caused by ENSO at all. The results of the southern Pacific of temp spikes and slow reduction of heat thereafter, until the next el nino, is the sole effect of ENSO. The reason the temps rise is because of the AMO. The ENSO dominates short term (2 to 6 years) temperature/climate, but not long term. The el nino just represents the spike in temperature. Thus, it appears as if the el ninos cause the steps themselves. If el ninos caused the steps, those steps would rise forever. With the AMO now flatline, the “steps” disappear and we talk about a “pause.” Now it appears the AMO will decline and, with that, you’ll end up with a collapse in temperatures. You don’t see temperature “steps” moving down in temp records. What you do see are several years of free fall in temperatures corresponding with the fall of the AMO. You see this last between 1945 to 1952 or so. Then a slow decline thereafter until 1976. You see another collapse in temperatures in mid 1880s as well. That’s what I think we’ll see at the other end of this el nino. We’ll see several years where the temperatures collapse, until they stabilize and decline modestly until the next climate shift in the 2030s. so what were you aiming to show in fig 9, which you used to illustrate when the El Nino’s happened. What you label as El Nino was already about the widest in the record and the dip was not that much lower the dip between it and the previous El Nino . This is the point that Willis made quite effectively with his ‘spot the volcano’ game: the dips are barely distinguishable from the usual variability in the rest of the record. I don’t think the effect is non-existent ( from other work I’ve done ) but it is a lot less that it appears to be if you don’t account for the fact there would have been roughly coincident dips anyway. Yes. That seems fundamentally different from animations I’ve seen of 1997/8. Are you saying there was a similar sub surface pre-cursor in 1997 ? Catch you later. thanks for the replies. Those upward shifts in ocean shore levels give the appearance of a relatively steady rise in the shore levels when the data are looked at shorally. As a result, the rise in shore levels have been incorrectly attributed to the tide coming in. I, instead, offer the opinion that the tide is due to the action of the waves, each one being a bit higher that the one before. There, you heard it first here. I believe it will answer your concerns. Surface current anomalies in the months of April, 2014. Blue is anomaly to the west and Red is anomaly to the east. Fairly typical of an El Nino. A cross-section of the Current anomalies. Again Blue is anomaly to the west. Red East. This one is a little unusual in that the central Pacific, the water at depth was anomaly to the west (actully this means the central Pacific was more-or-less at a stand-still at 150 metres depth but moving west at its close to normal speed at the surface). And the eastern part, was all moving strongly to the east down to 150 metres. Not typical in the central Pacific in this case but certainly in the eastern side. This is a very long very large animation of the equatorial cross-section for every month going back to 1979. It is only for those that have 5 mins to waste and might be interested in this. The super-El Ninos and the large La Ninas is the topic of interest with the animation but it is super-boring and a waste-of-time for anyone that it is not really into the ENSO. Heh, a small hot potato. give us more useful information. 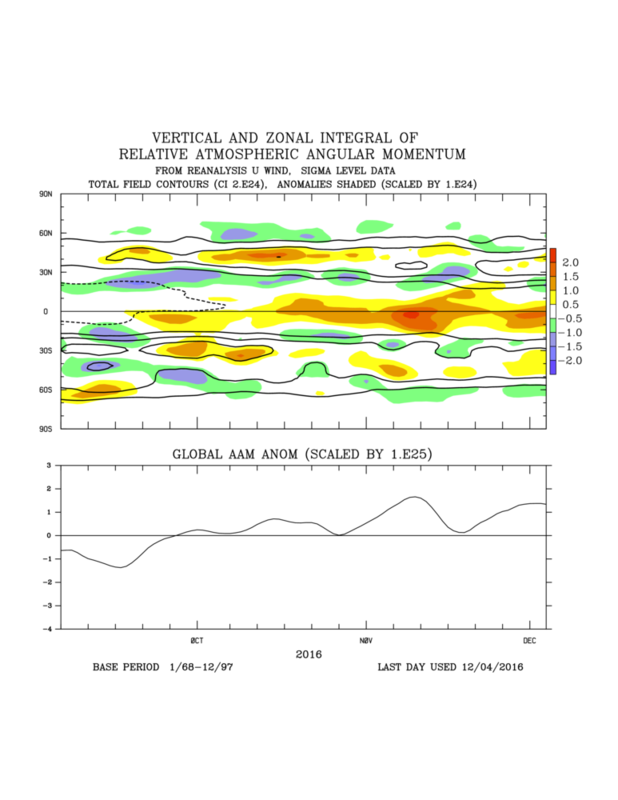 These “downwelling Kelvin waves” occur a couple of times most years, although the present one may be a bit warmer than most. The big question is whether the westerly winds will drop/reverse to allow much more warming in the eastern Pacific ocean. With only 3 El Nino events (86/87, 97/98, and 2009/2010) have the west winds and the PDO been simultaneously involved to give big El Ninos. These same 3 El Ninos had effect on the rest of the world ocean temperatures (albeit with a delay of 8 to 12 months), so were world wide events. I will wait to see if the current Kelvin wave starts an El Nino. Interesting how closely PDO follows Nino34 _since_ the pause started. Also interesting to see how Mt.P had no visible effect on Nino34 but did on the non tropical PDO. I think it’s funny, Greg, that I can almost convince myself I see Pinatubo’s effect persisting for around three years in Bill Illis’s link(last one at 5:52PM) to equatorial anomalies. It’s deep, heh, where I expected it. By the way, Bill, ‘super-boring’ and ‘waste-of-time’ is just bait. But you know that. 5-day Godas ocean model/observations have been updated. One issue with the ENSO is that it normally, eventually couples with or is reinforced by the atmosphere. In this case, not too much is coupling up. Trade winds, Atmospheric Angular Momentum, and the recent OLR/cloud patterns are boring and a waste-of-time (OLR/clouds have been more-or-less consistent until recently but not anymore). Jeff: Sorry about the delay in replying. I can understand your belief in the AMO, but I don’t agree with it. 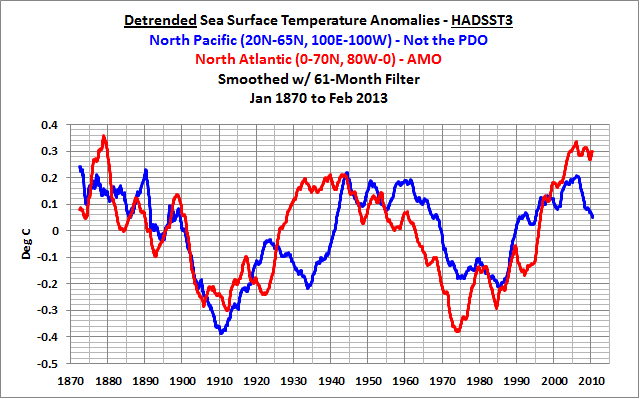 First, the sea surface temperature data of the North Pacific also have multidecadal variations that can be comparable in magnitude to the AMO, but the two run in and out of synch. Between the sea surface temperatures of the North Pacific and North Atlantic, the North Pacific sea surface temperatures would be more likely to influence the multidecadal variations of ENSO because they share an ocean basin. There’s no doubt that the surface of the North Atlantic has the highest warming rate. As a result, the sea surface temperatures of the North Atlantic strongly impact the adjoining continental land masses and cause additional warming of the land surfaces in the Northern Hemisphere. But the North Atlantic is the smallest of those subsets. It’s less than half the size of the East Pacific and less than one-third the size of the South Atlantic-Indian-West Pacific subset. In light of that, when the data are weighted by their surface area, the contribution of the South Atlantic-Indian-West Pacific to the warming of the global sea surfaces is much greater than the North Atlantic. And it’s the South Atlantic-Indian-West Pacific data that show the clear upward shifts in response to the El Niño events of 1986/87/88 and 1997/98. So the ENSO-related warming of the surfaces of the South Atlantic-Indian-West Pacific provides the greatest contribution to the warming of global sea surfaces, not the AMO. Last, regarding the hiatus, if we start the comparison of those three subsets in 1997 (without the area weighting), the East Pacific shows a slight cooling. The North Atlantic data and the data for the South Atlantic-Indian-West Pacific both show considerable slowdowns in the rates of warming, but they still show a little warming. It’s only the last decade or so that the North Atlantic sea surfaces have really flattened. Bill Illis: Thank you for all of the links to the animations. Interesting indeed, especially if it turns out that another reason for the differences between the PDO and ENSO is the impact of volcanic aerosols. If we have all this very warm water in the west Pacific, why do we have to wait for it to move to the east Pacific before it can warm the world? 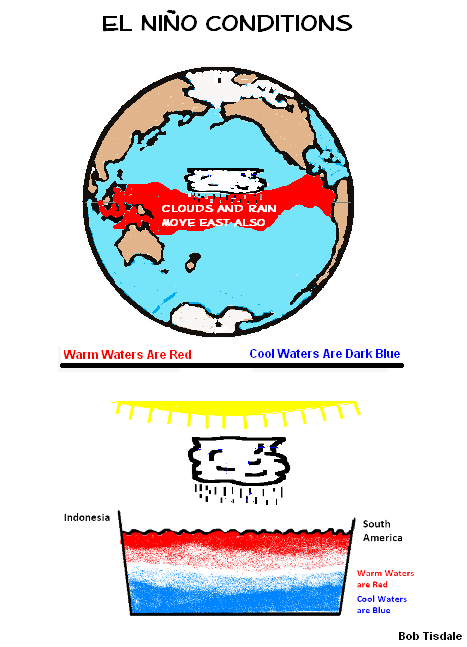 As explained in the post and those linked: (1) When the warm water travels east during the El Nino, there is more warm water covering the surface of the tropical Pacific, so the surface temperature of the tropical Pacific warms. (2) Much of the warm water that travels east came from below the surface of the western tropical Pacific, so that additional warm water on the surface contributes to the warming. (3) All of that additional warm water covering the surface of the tropical Pacific results in much more evaporation, which in turn releases heat to the atmosphere when it condenses and turns to rain. (4) The relocation of all of the warm water eastward changes atmospheric circulation globally (through changes in the jet streams in both hemispheres), and because of those changes in atmospheric circulation and how they impact regional climate, more parts of the globe warm than cool in response to the El Nino. Thanks for the question, Gary, because you’ve provoked a marvelous paragraph from Bob.